James Arthur (MA, 2001) has recently published his first book of poetry called Charms Against Lightning. Published by the prestigious publisher Copper Canyon, Arthur’s work has appeared in the New Yorker, The New Republic, The American Poetry Review and UNB's own Fiddlehead. 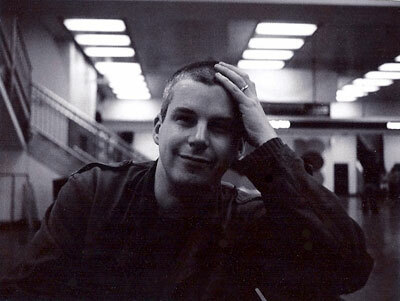 He was born in Connecticut, grew up in Toronto, and lived in Fredericton from 1998 to 1999 while attending graduate school in creative writing at the University of New Brunswick. He has received numerous rewards for his work including a Wallace Stegner Fellowship in poetry at Stanford University, a Hodder Fellowship in poetry at Princeton University and a Joan Nordell Fellowship at Harvard's Houghton Library. In 2006, Arthur received the $47,000 Amy Lowell Travelling Poetry Scholarship. In Charms Against Lightning, Arthur handles multi-layered images of the everyday that bloom into remarkable vastness, poems reminiscent of walking rhythms and rich with internal rhyme. Alive with stirring accounts of travel, intimate moments of solitude, and encounters with the ineffable, this book sings in striking language and sound, of personae and place, winding somewhere beyond selfhood. Arthur currently lives in Princeton, N.J. with his wife, fiction writer Shannon Robinson, and their son. During his time at UNB, Arthur studied under Ross Leckie, Mark Jarman, and Norman Ravvin and lived on campus in McLeod House. This is one of those poems -- we get them once in a while -- where, you know, we don't know who the poet is, and you see the poem, and you go, "Who is this? How did they do that?" This poem seems to me to have just come seamlessly from someone's mind. It's very intense. -- Poetry's monthly podcast: Don Share discussing "The Land of Nod"